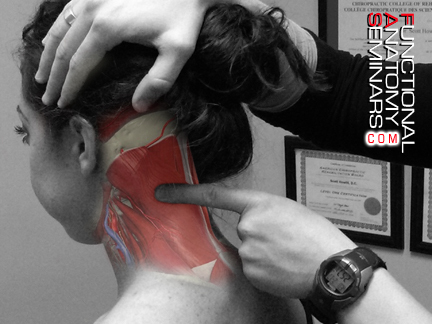 The Splenius Capitus muscle originates from the lower half of the ligamentum nuchae then courses superior-lateral to the lateral ½ of the superior nuchal line and mastoid process. Its innervation includes the medial and lateral branches of the posterior primary rami segmentally; as well as the greater occipital nerve (C2 dorsal rami). When activated the muscle acts to rotate the head such that the nose faces the ipsilateral side. Clinically – when fascial contraction/adhesion occurs in and around this muscle it can contribute to flexion-rotation blocks of the cervical spine; it is therefore a Functional Range Synergist** for cervical flexion-rotation. It is also commonly adhered with the neighbouring Levator Scapulae. Below I demonstrate an effective and comfortable assisted stretching technique for this structure. **Note: Functional Range Synergists are tissue groups that when functional allow a particular motion to occur. Conversely, if one of the tissues contracted or fibrotic, it can contribute to movement ‘blocks’ which then requires release. The Functional Range Synergists are part of the Functional Range Release™ soft tissue management system.